For those of you looking for some general information about humpback whales, Maui, and what to expect when coming here during whale season…you’re in the right place. Each time we head out for a trip I usually cover some of the FAQ’s so that we can more quickly get into the knitty-gritty of whales and their more interesting facts. Similar to my actual whale watches, if you have any questions you’d like to see addressed here, let me know. I’d be happy to add it to the list. Why do humpbacks come to Maui? The more information we find out about these animals the more the answer becomes, “I don’t know”. Traditionally, we have always believed they come here for the health of their calves. When babies are first born, they have very little fat on them. Being born into to 75+ degree water in Maui is much less of a shock than being born into the 38 degree waters of Alaska. Another reason may be the lack of predators. The primary predator of humpbacks are transient killer whales, orcas. Transients are a specific type of orca that I will discuss in more detail in a later question. There are several locations that whales have as viable options for breeding grounds, which brings us right back to the initial question. Ok, so they need a better location to have their babies, but what’s special about Maui? Maui county includes 4 islands, all of which are visible from the Lahaina side of the island. These four islands were once connected in one greater island, known as Maui Nui. This larger island was separated into four separate pieces of land toward the end of the last million years. Studies suggest that the islands have only been separated as recently as the last 250,000 years. 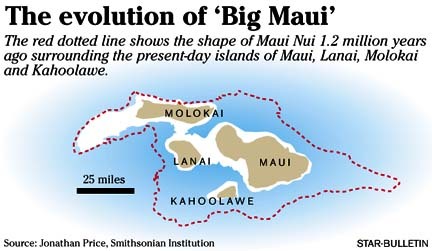 The water levels rose globally, the land mass has sunken, both of which contributed to filling in this body of water no known as the Maui Nui Basin. This is where our whale watches take place, it is also a protected marine sanctuary 6 months out of the year. Because of this unique geological history, the water here is no deeper than about 350 feet. This may sound deep, but consider that we are nearly 3,000 miles from any substantial land mass. Most of the waters surrounding Hawai’i is well over 10,000 feet deep. Our basin is quite literally the kiddy-pool of the Pacific. What do they eat while they are here? This is one of the more well known facts about humpbacks in Maui, but an interesting one regardless. These animals will typically fast for about 4 months out of the year. Those 4 months include their time migrating to Maui, the 5-6 weeks spent in the Maui Nui Basin and surrounding islands, and their migration back north. Do we have fish in Hawaii? Yes, but neither the type nor quantity that these animals need to sustain themselves. They could feed far off in the deeper waters, but the amount of energy expended in the search would not be justified by the quantity of food found. No road trip is complete without a stop at your favorite fast food joint, right? Whales have been known to veer from typical migratory paths to stop at mid-ocean atolls that are known feeding sites. How big are the humpbacks? What are the whales doing while they are here? Simple, mating and giving birth. The individual encounters and specific gestures that these animals display on any whale watch could certainly be unique to each individual, but generally, the behaviors we see out here all have to do with one of those two priorities. Yes, there is some debate as to whether these animals should remain on the endangered species list. In Hawai’i we see only one of several populations world wide. Our population primarily hangs out in waters bordered by the United States and Canada, needless to say, this population is doing quite well. The same is not true for other populations. Many smaller populations, in waters surrounded by countries with less strict conservationism, are still struggling. In the Maui Nui Basin, it is required by law for boats to maintain a 100 yard barrier between the vessel and the whales. Small craft operators may follow from behind or maintain a parallel course but cannot cut-off, position themselves in front of, or break that barrier. Even helicopters are required to stay 1,000 feet above the surface of the water. Most pictures and videos I post on this blog are of the whales much closer than 100 yards away, this is because they sometimes chose to come closer to us. If that happens, we shut down the boat and hang out. This is called “getting mugged,” and it is what we hope for on every trip. 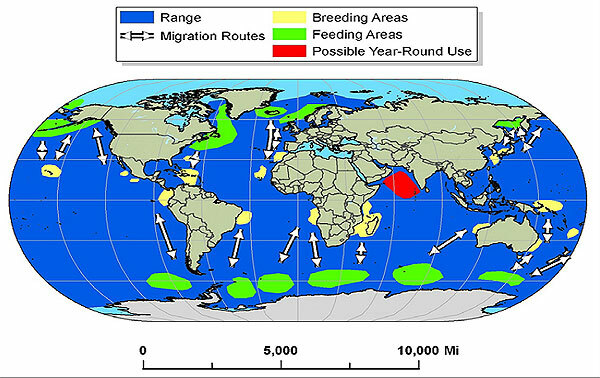 Below is a map that details the humpback populations of the world, both feeding and breeding areas. Who are the humpbacks predators? As mentioned previously, transient orcas as well as humans create the largest threat to humpbacks. Orcas can be broken down into several different groups, so different from one another that they are essentially viewed as different species among whale scientists. The only type of orca that is of concern for the humpbacks are the transients. Each group of orcas have a specific food source, language, and territory. When the transients cross paths with another type of orca they do not acknowledge one another, in fact, recent genetic testing has shown that transient orcas (marine mammal eaters), resident orcas (fish eaters), and offshore orcas (shark eaters) have not interbred in 7,000 years. Human threats have changed significantly in the last 30 years. Although whaling has been dramatically reduced on a global scale, we are still impacting these animals in other ways. Our overfishing is beginning to cut into their food source. They often get entangled in our fishing gear. Every year there is a number of “ship strikes,” which is when a boat hits a whale. not only is our physical pollution affecting these animals, but our noise pollution as well. Although humpbacks do not echo locate like many dolphin species, they do use low frequencies to communicate over long distances. Our presence in the oceans blocks and interferes with these messages. What is a whale’s gestation period? Whales will get pregnant here in Maui, then travel back to Alaska. When they are ready they will come back to Maui, the following winter and give birth. At this point their relationship with their calf grows into an inseparable bond. The mother will stay by her calf’s side for the next year of its life. She will nurse the baby, teach it life skills: how to breathe, swim, feed, and even show it the way to the feeding grounds. They will come back down to Maui together, and once they have arrived she will say her final goodbyes. At this point the calf is now on its own. Mom may decide to immediately return to the feeding grounds, or she may linger and get pregnant again. Why do whales breach? But more importantly, will it breach on our boat? To answer why whales breach, is like guessing why any human is smiling at any given time. There are a multitude of reasons, it completely depends on the situation and what is going on in the whales world. One known reason that a whale would breach is to work on removing barnacles and dead skin cells from the under side of their bellies. There are several other theories as to why they breach: looking around to see landmarks, communication, training a baby, warning aggressive males, announcing their presence, displaying dominance, or possibly for fun. To answer the second part of this question, the answer is as straight forward as it gets – no. These animals are well aware of our boat as we approach. Their sense of hearing is unmatched. They know where we are and I can’t imagine it being comfortable for a whale to land on a hard surface, like a boat, when they could land on something much more forgiving, like the water. I have the video here of the whale that did breach onto a sail boat off the coast of South Africa. I sort of wish this video had never been made so people won’t be concerned about this happening. But keep in mind this is a different species of whale (Southern Right Whale) and you never know the circumstances that led to these events. In Maui, this has never happened. Could it? I suppose. Could a coconut fall and hit you on the head everyday for the rest of your life? I suppose, but both are equally as unlikely.